Dominic Orsini’s first job—at a fast food joint—was hardly a glamorous start in the culinary world. His second stop wasn’t much better: he washed dishes at a small Italian restaurant. Nonetheless, Orsini liked the energy and pace of working in a restaurant. In high school, he decided that college wasn’t for him, so he asked his mom what she thought of him pursuing a culinary career. She couldn’t have been more excited and supportive—but she wanted him to take the choice seriously. “You have to go to the Culinary Institute of America,” she told him. It wasn’t until Orsini was at the CIA that his memories of childhood, his grandparents’ backyard gardens in particular, began to change the way he thought about food and cooking. It was as if these recollections, some of his earliest, had laid dormant, like seeds. He recalled the feel of a tomato picked off a vine, the taste of a watermelon on a hot summer day and the sight of a ripe red strawberry peeking out from under an emerald-green leaf. “It’s funny, there was a period when I forgot about those experiences,” says Orsini. “It was only when I went off to culinary school that it just came flooding back to me. Those times in the family garden really made a mark on me. Those childhood memories made me committed to growing from my own gardens. 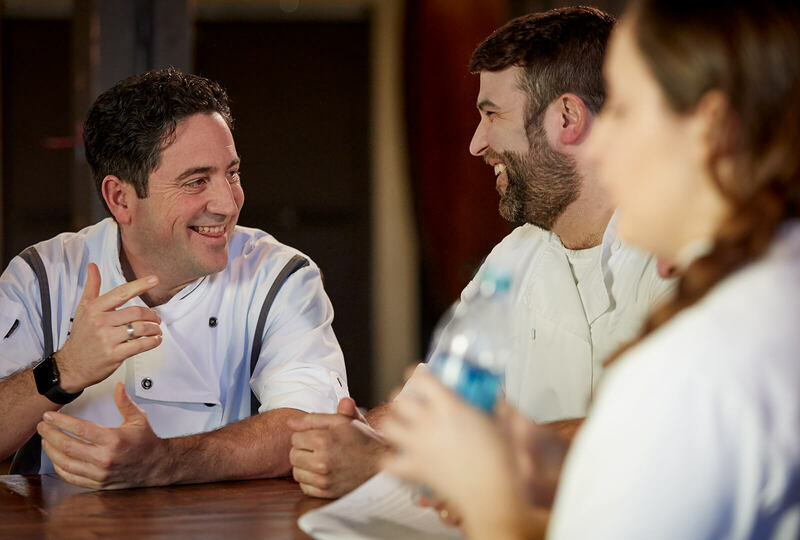 Orsini looks for innovative ways to connect his meals to that context with almost childlike enthusiasm and energy. For inspiration, he walks his gardens to see which herbs, fruits, and vegetables are primed for harvesting. He grows a specific type of corn to create his polenta and mills his own flour. He burns vine cuttings to smoke meats and repurposes cover crops to grow basil for his pesto. Leftover barrel staves fuel his wood-burning oven, and pinot noir and Cabernet leaves get used to braise meats. His is a passion that has, at times, led him almost to mad-scientist extremes. Not long after he came to the winery, Orsini learned that one of the Cabernet vineyards was going to be removed and replanted. He thought long and hard about how he might honor and preserve the essence of these decades-old plants, and, just before the last harvest, walked out into the rows and snipped a couple of bunches of grapes. He then put them into a mixture of flour and water, where the wild yeast on the grape skins started to feed off the sugars. Over time, he coaxed the mixture into a levain, a French term for a bread starter, that he still uses to bake bread and pizza dough. Orsini has a name for the experience of finding the perfect combination of food, wine, and place: making the angels sing. Those are the times when a moment crystallizes in your mind, you recognize where you’re at, what’s happening, and it’s a memory that stays with you forever. At home, with two young boys and a busy working wife, Orsini is more practical about cooking. In his family, he’s known as the master of the “refrigerator surprise”: when his wife tells him there’s nothing in the house to cook, he takes it as a challenge. Those improvisations, he says, have led to the creation of some of the family’s favorite dinners. To round out his “refrigerator surprise” meals, Orsini says he has no qualms with relying on premade or frozen items. He’s particularly fond of a premade jasmine rice, frozen mashed potatoes, and Hormel bacon bits. “Whenever I’m considering a packaged food, I’m looking at the back and reading that ingredient list,” he says. “I want to know what is in there.” His ideal is an ingredient list that’s relatively short, filled with easily recognizable items. Orsini now has the pleasure of introducing his sons to his own gardens: the one in his backyard and those at work. For now, they’re only mildly interested. (The cats the winery keeps as gopher sentries get the most attention during vineyard visits.) But he’s witnessed moments that have taken him back to his own childhood: he’s seen his older boy picking and eating alpine berries, and his younger son feasting like a bear cub on a bush of cherry tomatoes. Orsini doesn’t know when or if these experiences will resurface when his boys are grown, but parenting is a little like gardening itself: you plant memories and hope that someday they’ll grow and blossom.